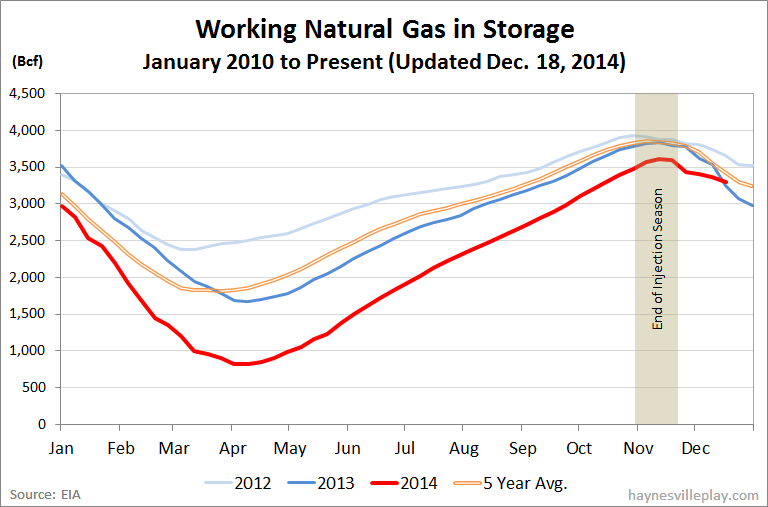 The EIA reported this morning that working gas in storage was down 64 Bcf to 3.295 Tcf. The weekly withdrawal was 75% lower than last year (-256 Bcf) and 59% below the five year average (-157 Bcf). The current storage level is now 6 Bcf above last year (3.289), but is still 7.3% below the five year average (3.553 Tcf, a difference of 258 Bcf). This week marks the first time the first time the current year (red line) has been higher than the previous year (blue line) since January 2013, an almost two year winning streak. As of February 20, 2014, the difference was an astounding 975 Bcf. Making up a 981 Bcf difference is ten months is just as astounding as a 975 Bcf difference in the first place, but it's still quite a reversal, albeit not entirely unexpected. Given the huge dip that storage took in early 2014, it was inevitable that there would be a reversal, but it never feels good to lose that first game. Expect the red line to stay above the blue line for all of next year.